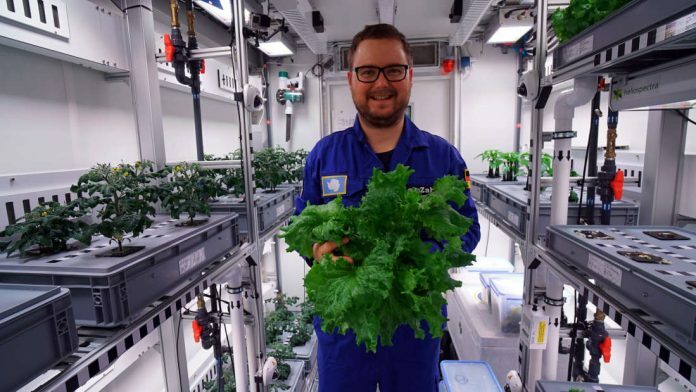 Researchers say they have successfully grown and harvested their first crop of vegetables, without soil or sunlight, and in the future, it could help astronauts grow food on other planets. “We have learned a lot about self-sufficient plant breeding in the last few weeks, it has become clear that Antarctica is an ideal test field for our research,” project manager Daniel Schubert told dw.com. EDEN-ISS, the name of the Neumayer Station III’s greenhouse, does indeed look like a shipping container, albeit one loaded with technology to test the best ways to cultivate plants in space. The facility arrived in Antarctica on Jan. 3, and was operational by early February. Researchers began sowing crops — all without soil, pesticides or sunlight, relying instead on principles of hydroponics. While these aren’t the first vegetables grown in Antarctica — McMurdo Station has been growing fresh vegetables for a while — they were still a welcome sight to the 10 researchers working at Neumayer Station III. Their supply of fresh veggies from late February had long-since been consumed. Now that EDEN-ISS is producing vegetables, it’s hoped that the garden will yield around 9 to 11 pounds (4 to 5 kilograms) of produce a week.